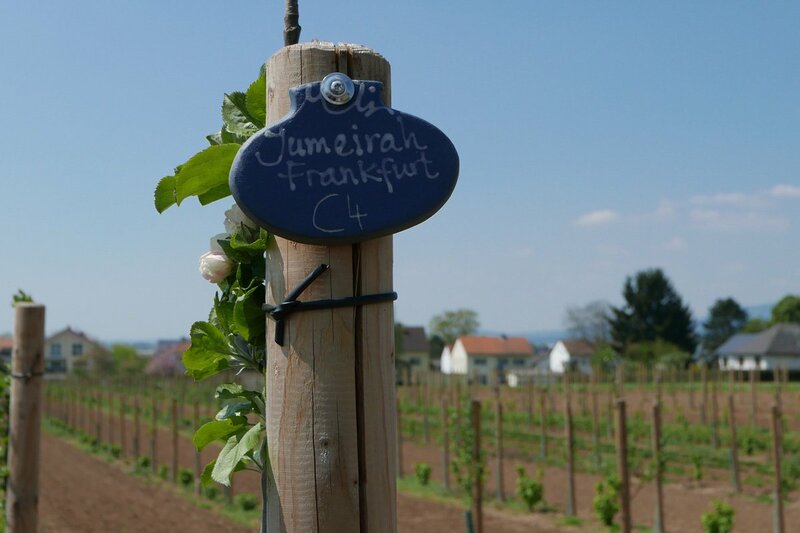 Companies, like Jumeirah Frankfurt, sponsor apple trees at Schneider Obsthof am Steinberg. All photos by Kristin Vuković. Last time we spoke to Kristin, she was chasing the grape vines in Croatia. She's still discovering sparkling apple cider in Germany. FRANKFURT – Mother Nature is feeling generous. After days of chilly, cloudy weather, the early May sun lights up the verdant German landscape. 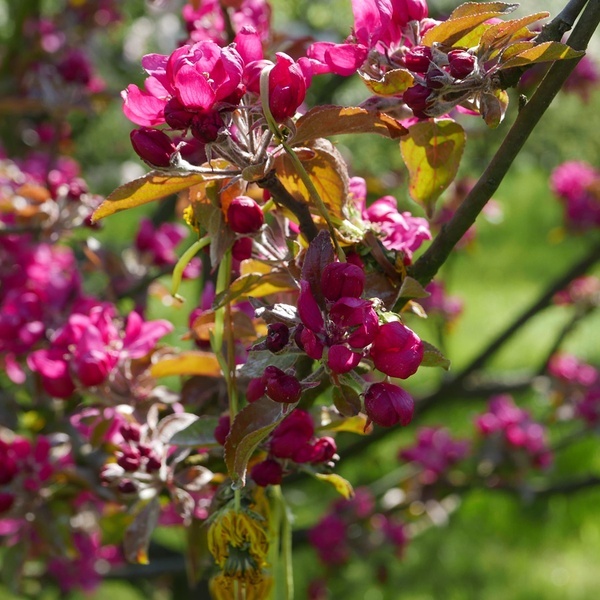 Apple blossoms — white, light pink, fuchsia — form a blushing canopy against the nearly cloudless sky. "In our language of fruit flowers, the intensity of flowers is only like this every three to five years," says apfelwein producer Andreas Schneider. "In this moment, nature gives me the future." I'm in Germany visiting Obsthof am Steinberg, the only family-run fruit farm in Frankfurt, to sample the region's famous golden beverage. Sparkling cider (apfelwein) has a long history, dating back to the 1st century AD when it was enjoyed by the ancient Greeks and Romans. It didn't gain popularity in Hessen, a state situated in west-central Germany that encompasses Frankfurt, until the 16th century when cold winters damaged grape vineyards in the area and winemakers were forced to find alternatives. Apple trees flourished in cold winters, so growers abandoned their vineyards for apple orchards and started producing a tart cider with a lower alcohol content — around five to seven percent. Apple wine is known to strengthen the immune system, promote mental vitality, and help prevent heart and cardiovascular diseases. It is traditionally served in a bembel, a light gray and blue earthenware pitcher. Sparkling apple wine and a traditional bembel. Schneider pours me a glass from his charming bembel, which reads "Obsthof am Steinberg" in blue, hand-painted letters. He oversees the orchard that his parents planted, which celebrated its 50th anniversary last year. "I grew up on this farm," Schneider says. "This was my playground as a child. I climbed trees; I cut them. Every job on this farm I learned." Early on, Schneider knew apple farming was his calling: He left high school to do an apprenticeship as a fruit farmer for three years in nearby Kriftel. For the past twenty years, Schneider Obsthof am Steinberg has farmed organically using a clever ampoule system: Each small vessel contains the sexual pheromone of female pests, which confuses the males so they don't procreate, resulting in fewer pests to harm the crops. The property has 250 varieties of fruit, including cherries, pears, and strawberries. Twenty-five workers harvest the fruits by hand, including 120 apple varieties, with more heirloom varieties added to the orchard each year. Companies like Jumeirah Frankfurt (my hotel for the trip) can sponsor apple trees, thereby safeguarding heirloom varieties for the future. Schneider plants both modern orchards, which take ten years to mature, and traditional orchards with high stem trees, which take twenty to twenty-five years to mature. "High stem trees are like typewriters — many people don't grow them anymore, but they produce unique copy," Schneider says. Uwe's son, Simon, explains the riddling process and shows sediment at the bottom of the bottles. 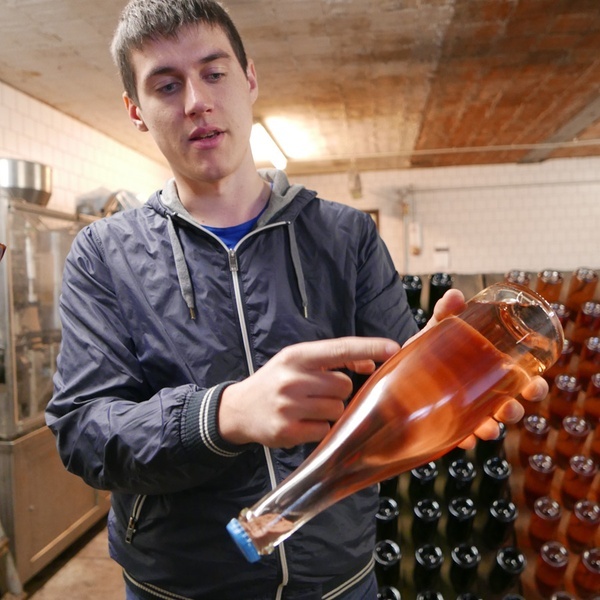 In another area of Hessen called Hochheim am Main, near the confluence of the Main and Rhine rivers, Weingut Schreiber produces sparkling wine using the riddling board method. Madame Clicquot (of Veuve Clicquot fame) developed riddling in France's Champagne region in 1816. The labor-intensive method paved the way for clear wine; it had theretofore been cloudy due to yeast and sediments. The riddling process collects yeast and sediment in the bottle and concentrates it near the mouth. After initial fermentation, bottles are stored neck-down at a 45-degree angle on a riddling rack made from two rectangular boards hinged at the top; each side has holes that hold the necks of the bottles. Over the next few weeks, the winemaker rotates every bottle a few degrees each day. After riddling is complete, the bottles are disgorged. Crown caps are removed, and the pressure within the bottles shoots out the sediment. Once the sediment is expelled, the bottle is quickly corked. The modern way freezes the neck of the bottle, resulting in the frozen sediment popping out in an icy chunk. Winemaker Uwe Schreiber still rotates bottles by hand and sometimes employs the old disgorging method he learned in Champagne 30 years ago: a very fast tilt of the bottle that requires timing, practice, and skill. The sediment spurts out, and he contains the remainder of the clear sparkling wine in the bottle with his thumb. "After a half million bottles, I think I have finally mastered it," he laughs. Weingut Schreiber produces 60,000 bottles annually, half of which are sparkling wine, in addition to delicious German Rieslings and other varietals. The family has a storied legacy in Hochheim: The first Schreiber produced wine in 1752. Now they use organic farming techniques due in part to the influence of Uwe's son, Simon, who studied winemaking and spent a year learning techniques in New Zealand. "All the young winegrowers want to protect nature," Simon says. A return to traditional organic methods is good for the environment and for the future of winemaking, producing a taste as individual as a human fingerprint. 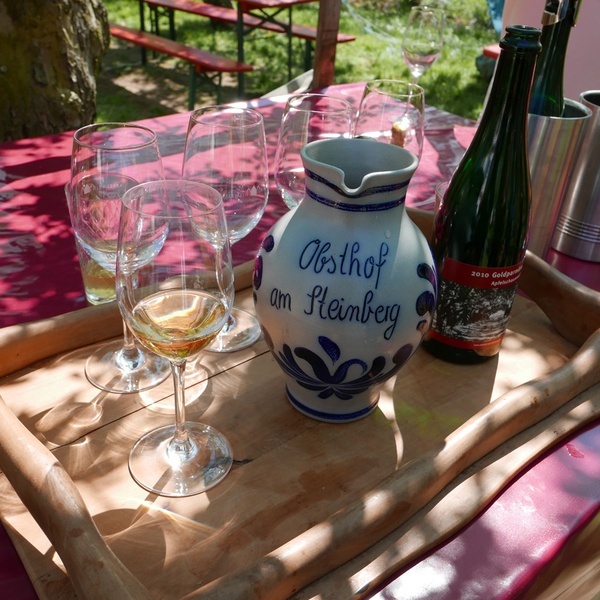 The wineries are about a little more than a half hour from Frankfurt and make for easy day trips. Frankfurt International Airport (FRA) is only 12 km from the center of town and is a central European hub. (Lufthansa has 22 nonstop flights from North American gateways.) You can rent a car at the airport or arrange transportation from town. Visits: The orchard organizes regular public events (€17-20 per person) as well as private tastings and tours (minimum ten people, approximately €30 per person). Email info@obsthof-am-steinberg.de or call +49-6101-41522 to make a reservation. Train: The journey by train to Nieder-Erlenbach takes about 45 minutes, including a short walk from the station. Click here for schedules. Taxi: A one-way taxi to Schneider Obsthof am Steinberg from Frankfurt Main train station costs approximately €40. Visits: The winery has an open door policy: People can stop by and sample wines they would like to purchase free of charge. Individual and group tours and tastings are customized depending on wines and food. A one-hour tractor-and-trailer vineyard tour plus tasting of five Schreiber wines costs €20 per person. Train: Take the nonstop S1 train from Frankfurt Main station to Hochheim (Main) Bahnhof, a 35-minute journey. From the train station, guests can call a taxi (+49-6146-4343) for the remaining 5 km ride to the winery, which should cost around €15. Taxi: Expect to pay around €55 per way from central Frankfurt. Kristin Vuković is a writer and editor living in New York City. She is a contributing writer for Organic Spa Magazine, and recent travel publications include BBC Travel and Afar. You can follow her on Twitter at @Vukovic and Instagram at @kristinvukovic. She travels for inspiration and the chance to be transformed.